Impress Blinds has been serving the UK market with high quality windows blinds at affordable prices for a very long time. Our main goal is to provide outstanding quality windows blinds in many different types including Vertical Blinds, Roller Blinds, Vision Blinds, Conservatory Blinds and many more. We have one of the most diverse collections of Cheap Windows Blinds that make your home beautiful and functional at the same time. Birmingham is a great town with a large population and commercial activity, Impress Blinds aims to provide all the interiors good looking blinds that boost the interior’s functionality as well. Our perfect Visionary Blinds (Vision Blinds for short) are the perfect options for the UK specific weather conditions in Birmingham. The glazed windows are quite enough to keep all the cold out and luxury Vision Blinds on top of them boost your window’s looks with their perfect perforated material designs and also provide the interiors with all the daylight required during the day. For all the homes and Offices in Birmingham, we present the perfect Vertical Blinds and Roller Blinds that cover windows up beautifully with unique designs and functional materials. The Roller Blinds are perfect where you want solid colors or printed designs on your windows and Vertical Blinds are perfect for a unique look with their striped materials allowing privacy and daylight at the same time. Other options that Impress Blinds offer in Birmingham include Wood Blinds, Velux Blinds, Metal Venetians, Roman Blinds and any other custom designs that you might be looking for. We also offer our clients customized designs that are not found in the market elsewhere, communicate with us your exact requirements and we will provide you with tailored solutions and Made to Measure Blinds that will fit your windows just perfectly. Avail our free next day fitting service in Birmingham to your convenience as well and don’t have to do anything by yourself. 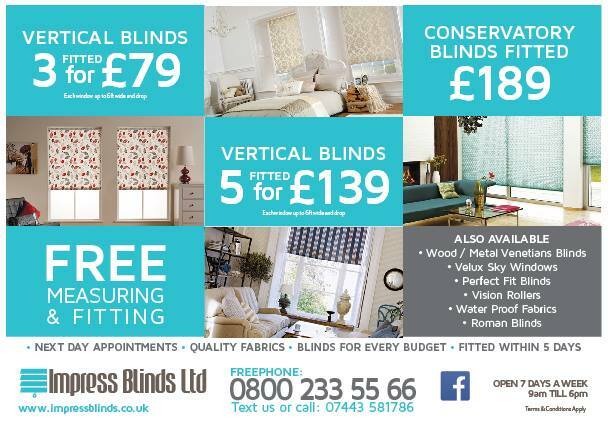 Our cheap prices include free measuring of windows for perfect fit blinds and also free fitting at your locations. Our major clients in Birmingham (UK) are much satisfied with our services.